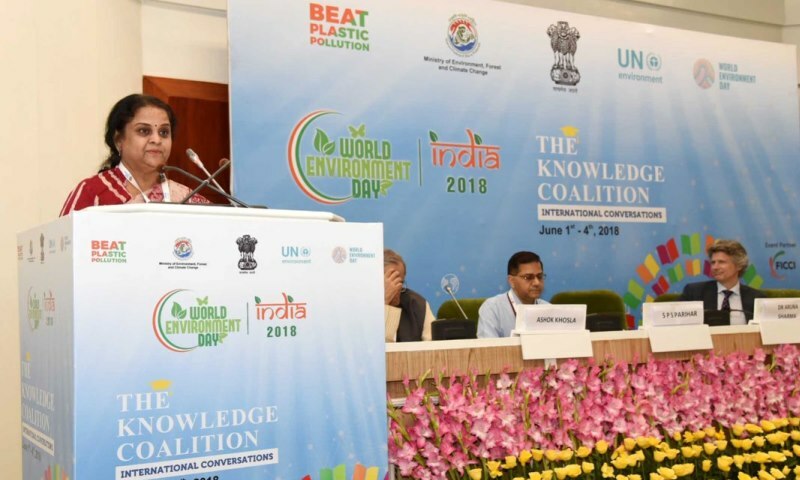 The Secretary, Steel, Dr. Aruna Sharma addressing the session on Sustainable Lifestyles towards enhancing Resource Efficiency and Circular Economy as the part of the World Environment Day celebrations in New Delhi on June 02, 2018. India is a host country for the World Environment Day this year. The thematic session on Sustainable Lifestyle towards Enhancing Resource Efficiency and Circular Economy was organised jointly by the Ministry of Environment, Forest and Climate Change (MoEF&CC) and Deutsche Gesellschaft für Internationale Zusammenarbeit (GIZ). The Session brought together policy-makers, regulators, international organisations, businesses, civil society and academia for a discussion on the pathways and key elements for shifting consumption patterns and lifestyles towards sustainable alternatives. Dr. Aruna Sharma, who chaired the session, talked about the idea of waste to wealth, which creates a win-win situation for all and also opined that plastic cannot be banned fully, but its size can be a critical component to maintain and that is why it is important to understand that plastic disposal is a bigger issue.